A pretty cool film noir that is quick and to the point, and filled with all those old noir trademarks. Detour is one of those classic film noirs that is completely straight forward in it’s simplicity and features a very minimal amount of characters. It’s the kind of film that could easily have been made into a play, due to how basic the premise and events are. There are but three main characters in the film, and what happens to them is a trail of interesting twists and turns. In many ways, the movie reminds me of the classic film noir Double Indemnity by Billy Wilder. Both movies involve a murder by the main character and then an attempt to avoid getting caught. And both start in the future and then jump to flashbacks. When we begin detour, we are with Al (Tom Neal), a guy who sits alone in a coffee shop, and looks like he’s a mess. His voice-over tells us of how his life has fallen apart and how he’s on the run. A man comes over to speak to him and Al is incredibly rude, telling the man to mind his own business. Al is hiding something and doesn’t want anyone asking him questions. We jump back in time to how this all started with al playing music for a show. The lead of the show is a beautiful woman named Sue, a blonde bombshell that every guy is after. She starts dating Al, and suddenly he is on cloud nine, on top of the world. Only it isn’t long before she gets a job somewhere else and moves to los angels. Al decides to leave his job and go to los angels to be with her. And so he starts hitchhiking cross-country. A man named Charlie Haskell, who seems like the friendliest guy imaginable, picks up Al. Charlie buys al food at a diner and chats it up with him during the car ride. He even lets al drive at one point. That’s when the trouble happens. Al is behind the wheel with Charles sleeping in the passenger seat, and rain starts falling down, hard. Only Charles doesn’t wake up. Al stops the car to check on his passenger and try to wake him. He wants to put the top up on their convertible, only no matter how hard he shakes Charlie, the man stays asleep. That’s when Al opens the door and Charles comes falling out, his head slamming into a rock on the side of the road. Charlie Haskell is dead. He wasn’t dead before, he was just in a very deep sleep, but now he is. I don’t love the way the movie made it look like maybe Charlie was dead before he even hit the rock. When he was in that deep sleep and Al couldn’t wake him. You had to wonder if the reason why Al couldn’t wake him, and the rain didn’t wake him, was because he was already dead. He wasn’t, of course, and only died when his head hit the rock, but that point would have been made a little more clear if Charlie had woken up a tiny bit, just long enough to mutter something, before falling out of the car. Al suddenly realizes how all of this would look to anyone, starting with the police, who he reported it to. It would look like al murdered Charlie for his money. No one would believe that this man just happened to fall out of the car and just happened to land on a rock. So Al goes on the run. He assumes the identity of Charlie Haskell and continues on, driving to Los Angeles. While Al didn’t commit murder himself, and the death was completely an accident, but not calling the authorities and instead taking on the man’s identity he crosses over the line in being a criminal. The second half of the movie is where al meets Vera, (ann. savage.) she is the femme fatale of the movie, reminiscent of Marlene Dietrich in witness for the prosecution. Al picks for up off the side of the road, a fellow hitchhiker who maybe he can do a favor for. That’s a big mistake, and maybe he’s thinking about female companionship when he does it, or just having company to talk to, but it’s pretty unrealistic that this guy who is on the run and trying to keep a low profile, would stop for this woman. 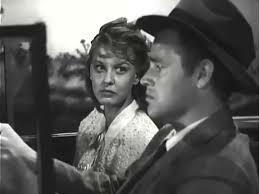 Still, he does, and he introduces himself to Vera as Charles Haskell. She goes along with it for a little bit but then turns to him suddenly and tells him that she’s not who he thinks she is. From there the movie changes course drastically. Al is suddenly being black mailed by his passenger who knows the truth about him. She instructs him on what to do and on other schemes she has in mind to make more money, and he has no choice other than to go along with them. Al continues to maintain the identity of Charlie Haskell, and he and Vera go on a sort of rampage of schemes, including trading the car in for another one, and lying about everything they tell the dealer. There is a great surprise at the end where another accident makes it so that al is now a wanted man fewer than two different names. On the east coast he’s wanted under the name Al Roberts, and on the west coast, under the name Charles Haskell. That’s what brings him to the coffee shop where the movie began, knowing that he can’t go back to the woman he loves because there is just too much heat around him. 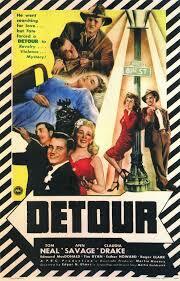 Detour is a pretty cool movie. It has a likable hero who starts out as a genuine nice guy pursuing the love of his life. When events take a turn on him and Al sees the way it would look from the point of view of the law, he acts rash and makes mistakes, only they are the kinds that we can relate to and sympathize with. The movie is only an hour and ten minutes long and that’s fantastic because a lot happens in that amount of time, and there is really no reason for the film to be any longer. Because of its short running time, the movie is straight to the point, and that goes a long way. It’s a pretty cool film, filled with wild twists and turns.